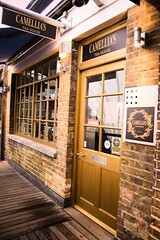 I am currently working part-time at Camellia’s Tea House, in Kingly Court, on Carnaby Street. 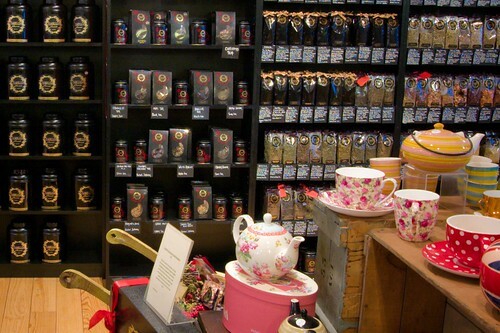 It is the sort of place that immediately feels like a slice of heaven to a tea lover – you enter and there is one wall filled almost to the ceiling with caddies and big glass jars. There are about a hundred and twenty different teas and tisanes here, while the rest of the shop is filled with all kinds of different teapots and tea accessories, and enough tables that it is usually possible sit down and be comfortable. It’s got a good atmosphere, with chilled out music playing most of the time, at a fairly unobtrusive level. 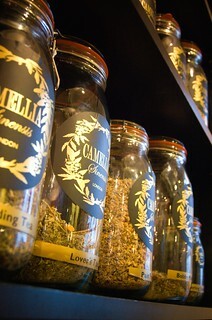 Slightly more than half of the teas are herbal, mostly Lubna’s own blends. These are largely named for their proposed health benefits, but by blending different herbs, Lubna also aims to produce infusions with interesting, well-balanced flavours, which is something she does very well. That leaves about fifty tea teas, including a few that aren’t pure tea – Earl Grey or pu erh with orange, rose-infused black tea and so on – along with some very good white, green, oolong and black teas. 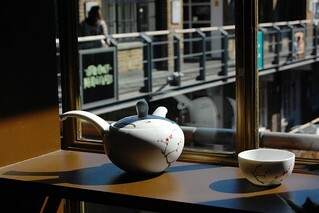 They currently have three oolongs – a Chinese milky oolong, and two less-peculiar Formosa oolongs, both very good.